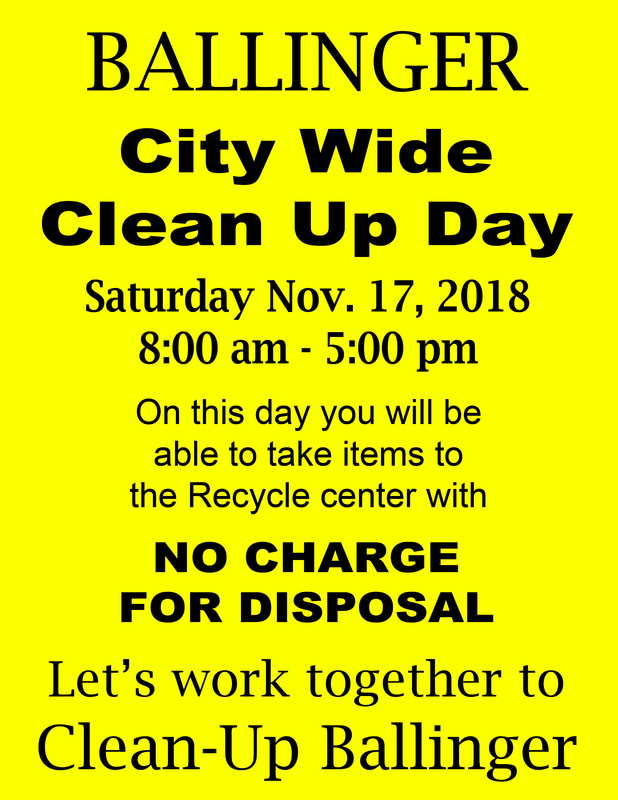 City of Ballinger Residents – On this day you will be able to take items to the Recycle Center with No Charge for Disposal. You will need to show a copy of your City of Ballinger Water Bill in order to participate. If you pay online, you can print off the bill or show a digital copy. The City will be working in conjunction with the State of Texas “Fall Sweep to Keep Texas Clean” Campaign. Employees will be at the Recycle Center to thank people for bringing items to throw away, passing out water, and registering people for a Door Prize / Drawing, at the end of the day as a reward for bringing items in. For information please contact City Hall at 325-365-3511.